The core of my art stems from an internal contrast of traditions, as I examine my heritage and environment. The human body represents an infinite terrain for exploration, analysis, and inspection. Working with various processes of printmaking, drawing, photography, installations, paper, fabric, thread, sewing and staining, my artwork evokes a sensual response. Metaphoric images and objects instigate a physical experience, creating a personal dialogue between the art object and the perception of the viewer. Examining the relationship between human life and the intense power of nature is continually amazing and inspiring. 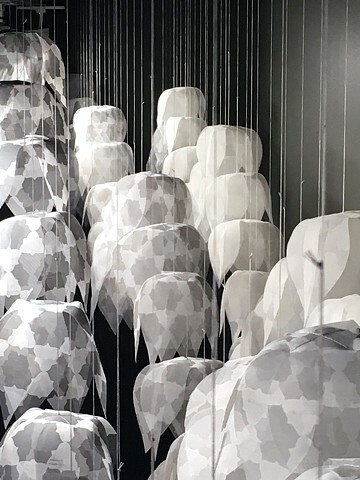 One facet of my work is site-specific installations, comprised of hundreds of suspended shapes that reflect various formations or patterns in nature. Hung in groups to form a larger overall shape, these ephemeral installations create a stimulating atmosphere, where air currents engage the hovering shapes to gently move and sway as the viewer moves around the piece. This engagement creates a sensory experience and physical connection between the viewer and the artwork, instilling a lighthearted feeling and renewed sense of calm. Lighting plays an integral role in this work, as cast shadows fall on the gallery wall and floor, and the pieces expand to fills the space. I enjoy the meditative experience of dissecting and recreating images, transforming materials into objects, creating hand-made shapes and striking use of color. Printing hundreds of pieces of translucent paper or fabric, folding, trimming, sewing, and turning them into invented structures, I also seek to reflect the history of womens work, domesticity, and hours spent performing repetitive tasks. My artwork is an introspective analysis of the presence of the human body; through tracing the history of touch, physical sensation, and emotional interactions, my intention is to explore, engage, and express our corporeal reality.